The #1 choice of pediatricians and parents, Desitin Maximum Strength Diaper Rash Paste works to effectively treat and help prevent diaper rash discomfort. Made with 40% maximum-level zinc oxide, this rich, thick diaper rash cream soothes and relieves on contact by sealing out wetness and protecting chafed skin due to diaper rash. Dermatologist- and pediatrician-tested, it is clinically shown to protect baby's delicate skin for 12 hours. The hypoallergenic formula of this diaper rash treatment is gentle enough for daily use and is free of parabens, phthalates, dyes, and soap. Desitin Maximum Strength Diaper Rash Paste provides 5-in-1 action to treat, heal, protect, soothe and prevent diaper rash, for healing you can see and relief your baby can feel. Instructions: Change wet And soiled diapers promptly. Cleanse the diaper area. Allow to dry. Apply paste liberally as often as necessary, with each diaper change, especially at bedtime or anytime when exposure to wet diapers may be prolonged. Store at 20 to 25 c (68 to 77 f). May stain clothing. 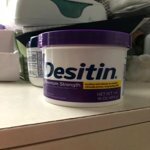 Desitin has always been my number one product for rashes it also works on everybody in the family if your thighs are rubbing against each other and getting irritated my oldest daughter uses it. If you're under arms are getting irritated from rubbing against each other and of course for babies bottom! Can't be without Desitin Maximum Strengh! If you're a mother, you know you can't live without this oitment! I love this product and have always used it wih my little ones. Can't live without it! Works always! My daughter had a really bad rash and I bought some of this and later in the morning it was already cleared up so much better that redness was gone and was pink now I recommend this product to all babies. If it wasn't for Desitin my daughter would still be in pain and crying . Make sure to give your baby a bath and then let them air dry and then apply the desitin on there rash!!! My son was born with genetic skin condition 2years ago and the only cream that we were buying Desitin Max Strength 16oz! He still would use the 16oz tub in 2 weeks, but they are no longer available. 4oz tube is inconvenient and lasts a couple days. As mom with special needs child I would love to have the big container back, otherwise will be looking for another brand. Not the Original Paste. Has been reformulated with different Inactive ingredients. The new formula is a totally different product. Whereas the real Original Paste was very thick, required smearing, and stayed where you put it (think the consistency of Jif or Skippy PB kept in the fridge) the new version is more like toothpaste. Kind of a problem with a product that is a nightmare to wash out of anything, esp. 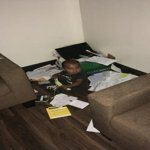 when diapering a highly mobile 9+month old. I am running out of the nice supply I bought from Babies R Us when my 6y.o. was born - which we used when I was working in the neonatal ICU and which my Mom used on us - the smell, not at all unpleasant, was unmistakably the same. The new one however is heavily fragranced. I will not buy it ever again. I've used Desitin original for 50 Years on both my boys and grandchildren. I purchased the PASTE last week for my great grand son and felt I purchased the creamy product. It was watery and oily. NO I wouldn't recommend this product for use. big air bubble took up half tube! Hello! We are so sorry to hear about this! We would love to help and learn more about your experience. When you can, please call 1-866-565-2229, Monday - Friday, 9am - 5:30pm ET. Thank you and we hope to hear from you soon! We want to learn more about your experience. Give us a call at 1-866-565-2229. We're available Monday-Friday 9AM-5:30PM ET. When you call mention your username to our team. We look forward to speaking with you soon! Oily mess; not the same ingredients it used to be! Just ran out of the 16 oz. tub I bought YEARS ago. Finally bought a new 16 oz. tub for my newest addition, and it's a runny, oily mess. I compared ingredients and realized Desitin changed it. Well they should have called it some other name and still kept the old stuff because the new doesn't compare to the old. We got rid of it and switched to another brand. It was a waste of money! And I feel bad because I've recommended the product to so many people without realizing it had been changed! Thanks for the feedback! We're sorry to hear about this, and we'd like to make this right. Please give us a call at 1-866-565-2229, Monday-Friday between 9A-5:30P ET so we can learn more about this experience. We look forward to speaking with you!